Boat Travel Hoist For Sale Can Lift Small Boat And Large Boat Easily And Safety! Great Choice For Boat Lifting! 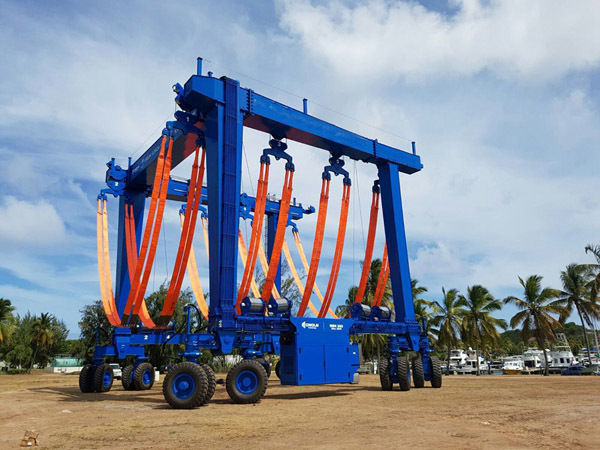 Boat travel hoist for sale has terse structure, it includes main structure, travelling wheel block, lifting mechanism, steering mechanism, hydraulic transmission system, electric control system, the main structure for the U shape. With simple system, boat travel lift is very easy to install, check and maintain. Travel hoist for sale is necessary device for lifting vessel. It can be used for lifting boat from water, putting boat in water and maintaining boat on the land. Ellsen Group, a reliable and well-known travel hoist manufacturer in China, supplies great marine boat travel hoists gantry cranes with factory price, such as port used small travel lift boat crane, wharf travel hoist, boat hoist for voyages, aquatic clubs and water sport meetings, cheap travel lift for sale, factory direct sales marine travel lift, remote control boat hoist, cabin vessel hoist crane. Customers can choose suitable travel lifts according to practical conditions and requirements. Great performance, convenient use, simple operation! Cost-effective choice! How to purchase suitable boat travel hoist for sale? According to specific conditions, customers can buy good and suitable vessel travel hoist from Ellsen! A floating boat hoist uses air to raise a boat out of the water. 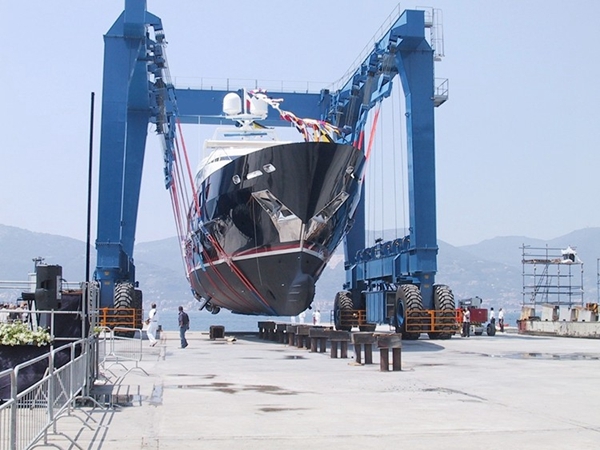 When the hoist is activated, the boat is lifted out of the water, cradled by bunks mounted on flotation tanks. One system pumps the tanks full of air to engage them to hoist the boat and floods them with water to float the boat. A newer type of floating hoist uses foam-filled tanks, which never need to be pumped full of air. When activated, these tanks are drawn together under the boat, raising it from the water. For loading capacity, there are high lift capacity travel lift and small boat hoist. The former type is perfect for heavy duty, such as 100 ton marine travel lift, 200 ton travel lift for sale, 500 ton mobile boat lift gantry crane, 1000 ton marine travel lift; the latter type is suitable for light duty, such as 10 ton travel lift, 25 ton marine travel lift for sale, 60 ton boat hoist. For use-place, customers can choose type as following, yacht vessel hoist crane, and port used travel lift boat crane, travel lift for voyages, aquatic clubs and water sport meetings, construction travel lift. In a word, Ellsen travel lift crane is a great choice! It has many advantages, such as factory direct sales, good price, ISO approval, high safety! 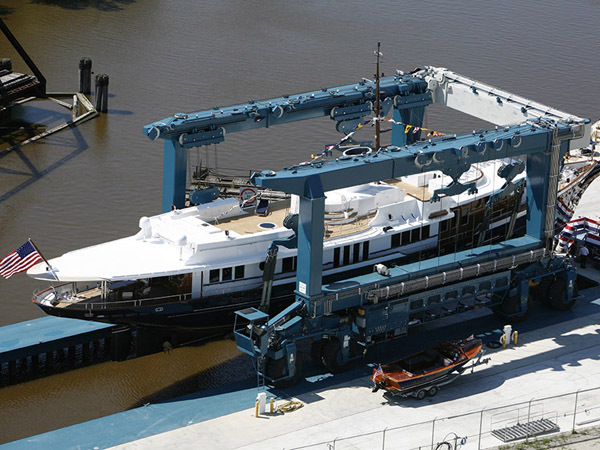 Buy Ellsen boat hoists gantry cranes now for more benefits! Cheap small boat lifting crane is a pretty good choice for customers. Compared with large travel lift, small boat crane price is lower. Customers can save much cost. What’s more, small boat crane is lightweight, it can travel flexibly. Ellsen cooperates with small boat lifting crane factory, and provides the best small boat lift for sale. Small boat lifting crane not only saves energy but also improve working condition. For lifting light boat, small boat lifting gantry is suitable. Ellsen travel lift gantry crane has advantages of simple system, durable lifting sling, flexible traveling wheels, reliable safety device and reasonable design. China small boat lifting crane is suitable for transporting light boat. 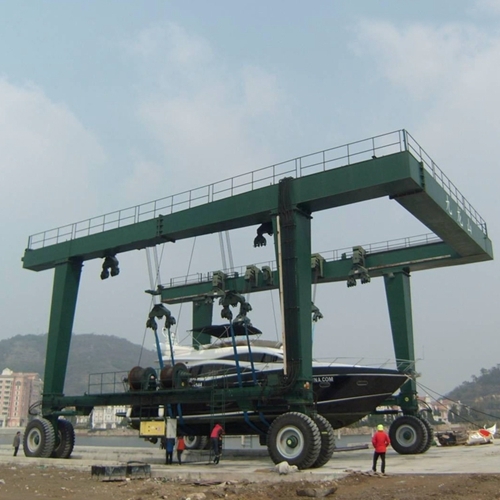 With compact structure, boat lift crane for sale is simple to check and maintain. With light dead weight, small boat gantry crane can move fast. With durable material, small boat travel lift has long service life. 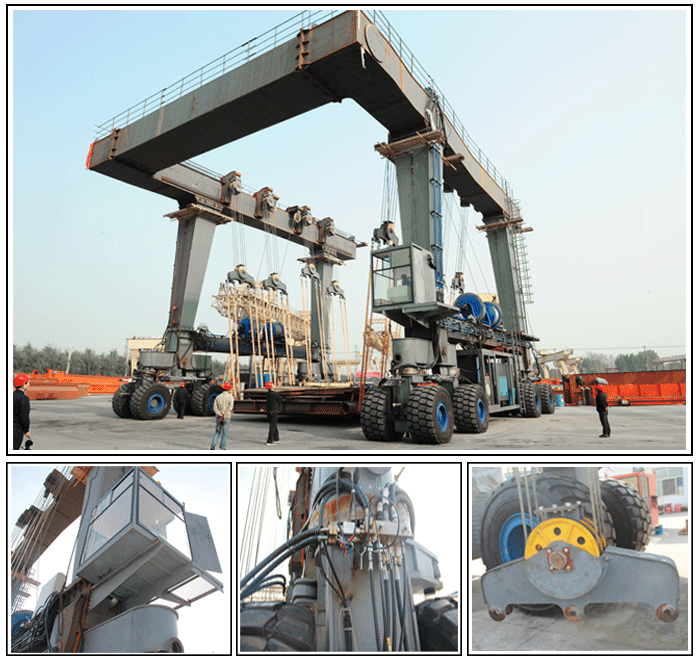 China large travel lift is great choice for lifting heavy boat. With high loading capacity, heavy boat lifting gantry crane can lift and transport large boat from one place to another place. Heavy boat crane for sale is safe to operate, because it has complete safety protection devices, such as overload limiter, speed limiter. Where to purchase top quality China hoist travel lifts? 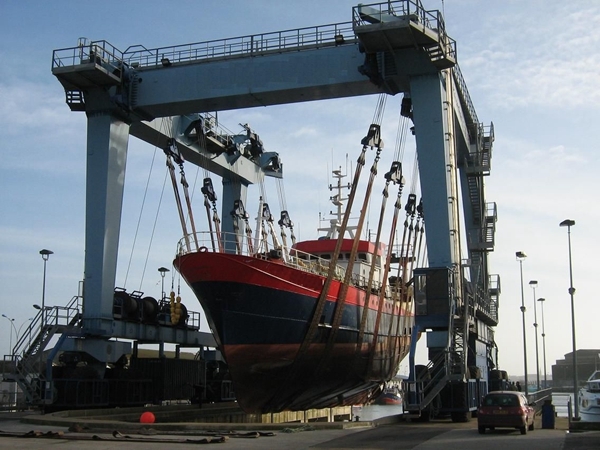 Just buy boat lifting gantry crane from Ellsen! Ellsen travel hoist for sale is widely used for fields, such as construction, water sport meeting and dock. 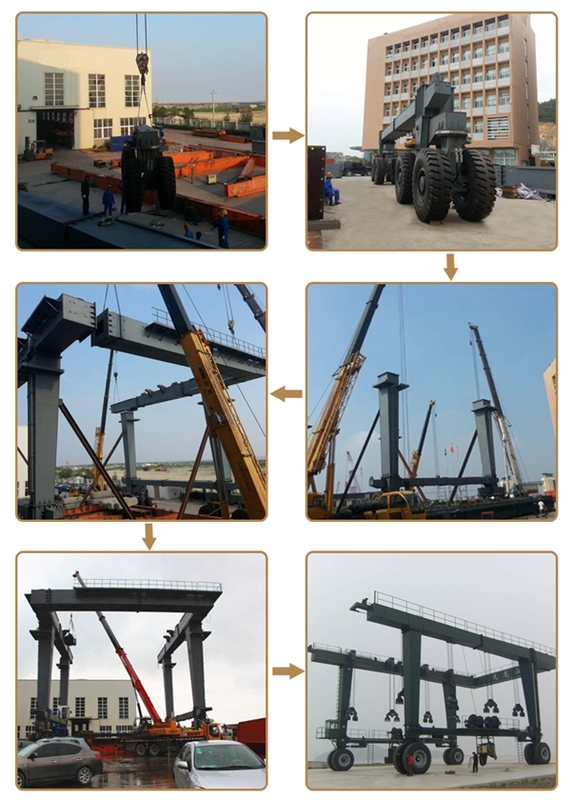 In addition, Ellsen designs China boat lifting cranes drawing according to practical needs and requirements. Ellsen provides customized service for perfect user experience. 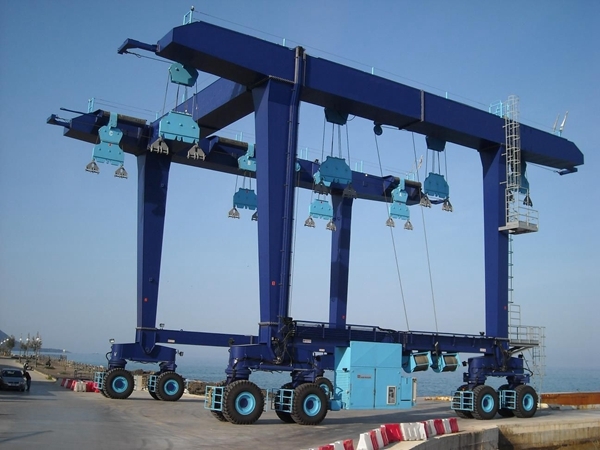 Why choose customized boat lifting gantry crane? Customized travel lift is nice device for lifting boat. 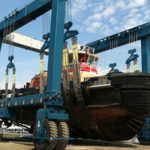 It includes customized small boat lifting crane and customized large travel lift. Customized marine condition small crane has reasonable design and simple system. It takes little time to check and maintain. Ellsen provides small boat travel lift for sale, such as 25 tons travel lift and 35 tons travel lift. Ellsen also has customized heavy travel lift, such as customized 100t travel lifts. 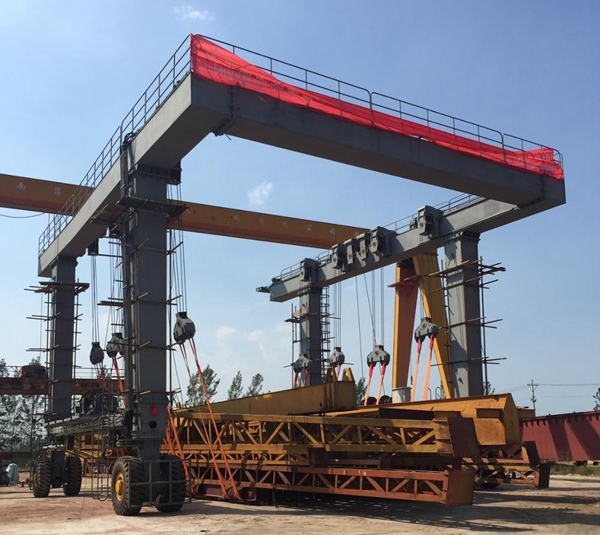 Many customers buy Ellsen cheap 100t rubber gantry crane for boat lifting, because Ellsen provides customized boat lifting cranes drawing based on working conditions. 100t travel lifts factory produces travel lifts with strict standards. This can ensure boat cranes for sale high quality. Once a customer wanted to buy 200 ton travel hoist, but still worry about the safety. 200t marine boat hoist factory also puts crane safety on the first place and designs boat gantry with higher safety level. The customer was very satisfied after visiting the factory. 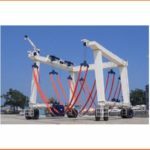 Where to buy wholesale marine travelift mobile boat hoist? Low price marine mobile boat hoist group is not difficult to find in China. Ellsen is such a wholesale marine mobile boat hoist group, and provides cheap marine travel lift. 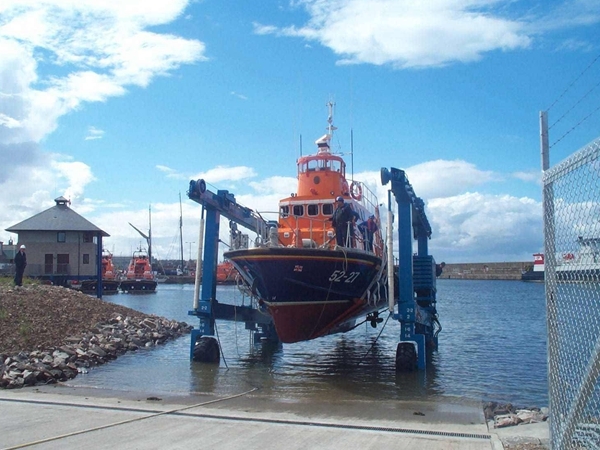 Discount small boat lifting crane is great choice for transporting tiny size boat. As a professional crane supplier in China, Ellsen provides customized discount boat lifting cranes drawing. Thus cheap boat hoist crane from Ellsen can adapt to working conditions well. Ellsen discount boat hoist crane also has good performance. It moves stable and smooth. The traveling wheels are flexible and can move with 360 degree. Ellsen travel lift for sale can climb gentle slope safely. 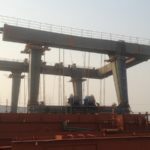 How to save boat lifting gantry crane price? Many marine mobile boat hoist group suppliers have discount for customers at the end of the year. Ellsen, a customized marine mobile boat hoist group in China, also provides discount mobile yacht boat hoist lifting crane. Ellsen, a professional marine mobile boat hoist group, cooperates with strong boat lifting gantry crane factory. 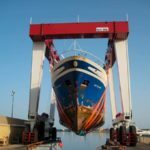 Traveling hoist factory produces travel lift for boats strictly. Every customer has different requirements, traveling hoist factory designs travel lifts for sale according to practical needs. All producing processes have standards, marine travel lift factory ensure every process perfect condition. Smooth running boat travel hoist for sale is used for shipyard, yacht club, and water entertainment center, and navy. It is mainly used for boat repair and maintenance work, whose rated capacity is 25~800t, full hydraulic drive. 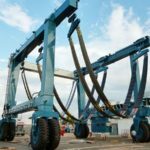 This particular boat lifting crane is used flexible lifting belt to pull the boat bottom, multi-point lifting at the same time. Running and steering method is diverse, General speaking, it can be straight running, skew running, cross running, yaw running and pivot running. Our clients can choose different configurations according to their needs. Smooth running boat travel lift for sale is composed of leg, longitudinal beam, cross beam, hydraulic winch, crane travelling mechanism, hydraulic pump station, diesel unit and so on. 4. Lifting mechanism adopts the load-sensitive hydraulic system, the lifting point distance can be adjusted to keep the simultaneous lifting of multi-lift points and output power according to the load conditions, so that the energy consumption of the whole machine is reduced. 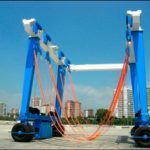 How to ensure the safety of boat hoist crane? As a large lifting crane, safety is very important for vessel hoist crane. Reliable safety can protect the operator and prolong the crane service term. The following tips are about travel lift purchasing, maintaining, checking and operating. 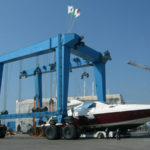 For travel lift purchase, it is vital to buy qualified boat lift crane from professional supplier. Because professional travel lift manufacturers pays attention to the quality and customers, they design and provide travel lifts with complete safety protection devices. Regular maintaining and checking work is essential, especially daily check-work before using the crane or after using the crane. This can help the operator find the problem earlier, reduce the risk rate and avoid damage. Proper operation is basic requirement for the operator. It is related to the operator safety and crane itself. Correct operation can avoid accident, reduce damage, protect the operator, prolong crane service life, improve working efficiency and save much maintenance cost.